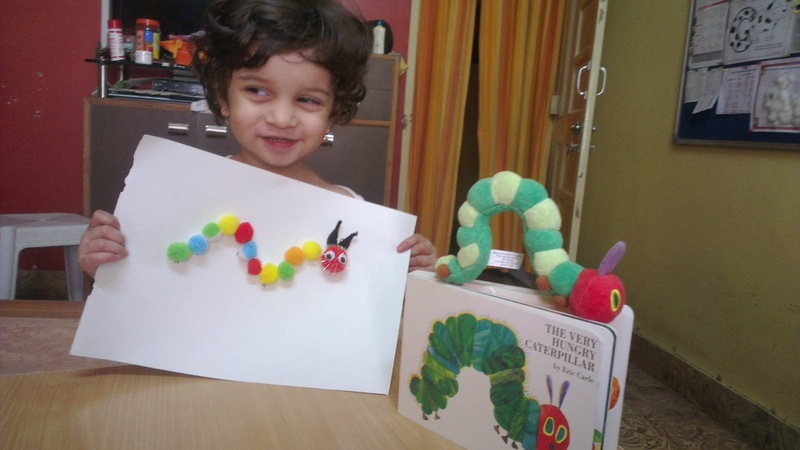 Today, the very hungry caterpillar completes 45 years of publication! What a book it is! The like-cycle of a butterfly, counting numbers, days of the week, everything is crammed into that book without overwhelming its readers! hence, at the Bubble-Ink challenge, this was our today's prompt. You must be wondering only 35 books read today? That's because The Very Hungry Caterpillar was read 26 times in a single day in this challenge, by far, the most read one too! And yes, it was also the easiest compilation of everyone's reads till now! And to show our love and admiration to Eric Carle, we celebrated Eric Carle Day reading all his titles which we have so far - The very hungry caterpillar, the bad-tempered ladybug, the very quiet cricket, brown bear brown bear what do you see?, My very first book of animal homes and From head to toe. And if that was not enough, we also dabbled in a bit of craft. We made a colourful caterpillar using pom-pom balls.